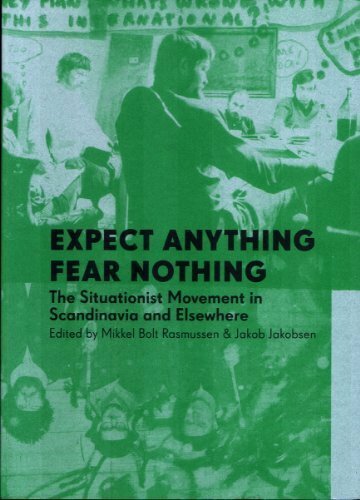 Expect Anything Fear Nothing – The Situationist Movement in Scandinavia and Elsewhere. This volume is the first English-language presentation of the Scandinavian Situationists and their role in the Situationist movement. The Situationist movement was an international movement of artists, writers and thinkers that in the 1950s and 1960s tried to revolutionize the world through rejecting bourgeois art and critiquing the post-World War Two capitalist consumer society. The book contains articles, conversations and statements by former members of the Situationists’ organisations as well as contemporary artists, activists, scholars and writers. While previous publications about the Situationist movement almost exclusively have focused on the contribution of the French section and in particular on the role of the Guy Debord this book aims to shed light on the activities of the Situationists active in places like Denmark, Sweden and Holland. The themes and stories chronicled include: The anarchist undertakings of the Drakabygget movement led by the rebel artists Jørgen Nash, Hardy Strid and Jens Jørgen Thorsen, the exhibition by the Situationist International “Destruction of RSG-6” in 1963 in Odense organised by the painter J.V. Martin in collaboration with Guy Debord, the journal The Situationist Times edited by Jacqueline de Jong, Asger Jorn’s political critique of natural science and the films of the Drakabygget movement. Contributors: Peter Laugesen, Carl Nørrested, Fabian Tompsett, Mikkel Bolt Rasmussen, Jacqueline de Jong, Gordon Fazakerley, Hardy Strid, Karen Kurczynski, Stewart Home, Jakob Jakobsen. Text: Balt Rasmussen Mikkel, Jakobsen Jakob. pp. 288; BW ills. ; paperback. Publisher: Nebula, Copenhagen, 2011.